Sinking Ship’s award-winning Annedroids (airing on TVO and Amazon Prime) is a live action, sci-fi adventure show for the 6-9 audience. Featuring the misadventures of 11-year-old genius Anne, her neighbourhood friends Nick and Shania, and her junkyard-dwelling tribe of handmade androids, this show provides endless learning opportunities, fun plot lines and age-appropriate humour. Annedroids’ most obvious curriculum focus is on STEM learning – Science, Technology, Engineering, and Math – however the show also embodies social learning through cooperation, friendship, and empathy with aspirational role models. Best of all, Annedroids places a female protagonist in a STEM role, which is engaging for all kids and helps girls spawn an interest in these typically boy-skewed subjects. These fundamental concepts involved in building a solid foundation of STEM learning can all be observed in Annedroids. Through various situational conflicts the kids must resolve problems using scientific theory, technological problem solving, and engineering, all the while broadening their technological literacy and understanding of the interrelations and risks associated with science and technology. Each episode follows a basic schema, in which the team tackles a real-life challenge using scientific and technological solutions, often facing additional complications that cause them to revise their approach in order to reach a resolution. Using Season 1, Episode 3: “Reduce, Reuse, Robocycle” as an example, I will outline how Annedroids exhibits each of the skill sets associated with the Curriculum’s goals. Firstly, “Reduce, Reuse, Robocycle” demonstrates a practical application of science and technology to solve a social challenge. 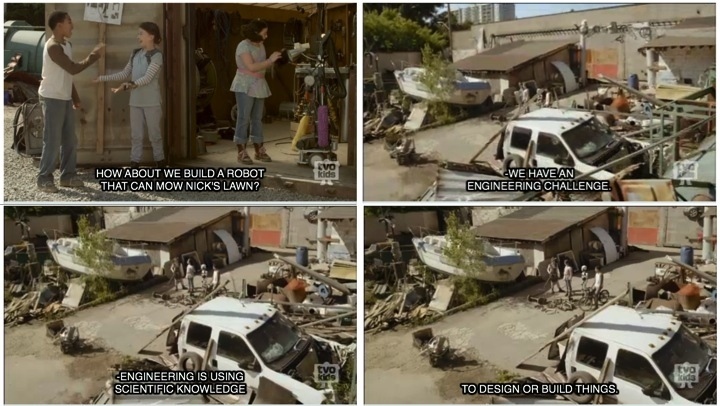 Nick wants to hang out with his friends but must finish his chore of mowing the lawn, so the kids decide to build a lawn-mowing robot out of spare junkyard materials. This episode also has an underlying environmental focus as Anne and Nick’s Mom show their excitement towards the environmentally sustainable approach of reusing other people’s waste. Likewise, “Reduce, Reuse, Robocycle” incorporates each of these skills to resolve the kids’ engineering challenge. After learning about Anne’s CLEANOBOT, the kids initiate a plan to build a lawn-mowing robot for Nick. They perform a search through the junkyard for engineering materials, such as a bike and some wheels. Then Anne designs a potential prototype and they video record her solution using her android, EYES. During the recording, Shania helps to communicate Anne’s academic wording with a fun (though somewhat oversimplified) explanation of their procedures. Once their prototype is assembled, they successfully test it out in the junkyard and conclude that it is ready for Nick’s lawn. Unfortunately, the team quickly realizes that they hadn’t accounted for inconsistencies in the grass that could set the mower off-course, and sure enough, it plows right through Nick’s Mom’s marigolds. Their critical analysis determines that the problem is maintaining the direction of the mower – but how? Hearing a train go by as they reflect on their failure, Nick and Anne quickly interpret the solution together – TRACKS! Using garden hose to create a path on the lawn, the kids adjust for their next test by setting a track for the mower that effectively avoids the garden patch. They even had time to make some replacement flower art out of recycled parts from the junkyard! Nick’s Mom is thrilled with their successful findings, and impressed by their resourcefulness. a process of exploration and experimentation […] that uses concepts and skills from other disciplines (including science) and the application of this knowledge to meet an identified need or to solve a specific problem using materials, energy, and tools (including computers). Technological methods consist of inventing or modifying devices, structures, systems, and/or processes. In this sense, Annedroids is inherently a technology-based kids’ show, and yet one that succeeds at being as engaging as it is educational. Less than 10 minutes into the first episode, I was thrilled to see a well scripted and seamlessly flowing piece of children’s content that really grabbed my attention. With top-notch visual effects and excellent direction, it is one I would recommend to everyone from parents and teachers to the curiously young-at-heart.